Following the tragic terror attacks in Christchurch on 15 March 2019, we offer a message of aroha to those suffering right now and to all the Muslim community. Christchurch Terror Attacks – reflection by Ajahn Chandako, Vimutti Buddhist Monastery. 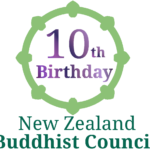 New Zealand Buddhist Council 10th anniversary.